School meals are a very topical issue. At Sellincourt school in Wandsworth, William Martin provided a full multi-disciplinary design service to form a new kitchen and dining room block. This involved demolishing an existing postwar building, approximately 50 years old. The building was demolished over the summer holiday period, in order to minimise risk to children. It was replaced with a new traditionally designed and constructed kitchen and dining room block. William Martin undertook the Architectural design, as well as arranging the Mechanical and Electrical Services and Structural Engineering design, specified the works and administered the contract. The whole project was completed in 20 weeks and the contact value was circa £450k. 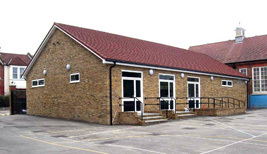 The children of Sellincourt school now benefit from a modern and hygienic kitchen and dining room, which is a vast improvement on the previous facilities.